TRON (TRX) Price Prediction: World DApp leader? TRON is a cryptocurrency and a foundation founded by Justin Sun. The TRON cryptocurrency was launched on August 28, 2017 and became a huge success later in 2018. It is currently one of the biggest cryptocurrencies in terms of market capitalizations, TRON price predictions are among the most positive one the market. However, let’s talk about the most likely TRON price for 2019. TRON is a blockchain-based project designed to build a platform for digital entertainment. The idea behind the crypto is based on the presupposition that the current digital content platforms like YouTube or iTunes have too much control over the developers and content creators that work on it. The blockchain technology can provide a decentralized data distribution platform that will be free from censorship, fast and secure. The Tronix (TRX) cryptocurrency was created to power the network and to use as an encouragement tool for content creators. The platform seeks to provide its participants with a fair and reasonable distribution of the income generated by the content of the platform. The TRON cryptocurrency is developed and maintained by the TRON foundation. The foundation is currently headed by Justin Sun – the current CEO of the organization. The Tron price chart showed its largest peak shortly after the launch of the coin. It happened on January 5th, 2018 when the price of TRON reached a mark of around 25 cents per coin. However, similar to the whole cryptocurrency market, TRX price dropped shortly after the peak. Nevertheless, the TRON price history is quite stable, compared to most of other market participants. It is clearly seen on the TRX price chart that beside the one significant price growth in the late April, the coin price was placed within a frame of around 2.5 cents. The coin is in a stable position since the TRON price dropped after its peak in January. TRX is not very volatile and the only significant price changes happened during the previously discussed increase in April. Most of 2018 was spent around the same value, even increasing in price on a course of the time period from late summer to the start of 2019. It is safe to say that TRON is one of the most robust cryptos on the market as it was significantly less damaged by the current downfall of the industry. The Tronix price prediction is one of the most positive in the industry. The coin shows an unmatchable stability (if we don’t consider stablecoin as competitors 🤓). In fact, the coin almost doubled its price over the course of the winter 2018-2019. The crypto have already been the best gainer of a week since the start of the year. For example, the coin managed to become the biggest gainer of the week from January 21 to January 27. In addition to the coin’s financial results, the positivity of the TRON price prediction is supported by its development progress and the social activity of its team. For example, the TRON accelerator provided the project with multiple new TRON-based decentralized applications (dapps). The company also holds a niTRON SUMMIT in San Francisco, California, raising awareness about the product. The TRON cryptocurrency in already one of the most technically advanced coins on the market. The Delegated Proof-of-Stake consensus algorithm provided the TRON blockchain with a very high transactions per second parameter and high scalability. The usage of TRON is available via multiple devices (phones, tablets, PCs). The platform has well-written technical documentation for both its own developers and the outside participants of the project. The coin is widely dependent on the decentralized application market. All the price predictions are, ultimately, coming from two other anticipations – an anticipation of the future financial results of the market of dapps and the possibility of the success of the TRON competitors; for example, Ethereum, EOS and NEO. All these platforms have no strong focus on the digital entertainment industry but also provide successful framework for the development of dapps and smart contracts deployment. TRON has its advantages over the mentioned platforms as it is, for example, faster than Ethereum, the major and stable top-3 crypto. The coin was also improved in terms of availability for both developers and users. However, the competitors of the TRON project also have their strong sides. Ethereum has a first-mover advantage and a massive media presence. The NEO project provides physical assets digitalization, the EOS platform is a world leading cryptocurrency in terms of transaction speed. And the list of the TRON competitors mentioned above is far from being complete. Despite having multiple (and rather successful) competitors, the project is one of the current leaders of the industry. The coin is widely seen as a promising investment and it positively affects TRX price predictions. The current TRON CEO reported that the platform has a uptrend in terms of newly deployed dapps and the blockchain. Every new successful dapp is a big supporter of the future financial stability of the project. The most likely TRON price forecast for the nearest future is an ascending trend with high volatility. The current state of the market is very unpredictable and the coin can be affected by the market fluctuations. However, the TRON price prediction is not the same as for other coins as the TRON price is not as speculation-based. As the TRON coin will get more and more use cases its price will grow accordingly. The TRON price forecast is dependent on how much users will the coin attract in the future and it currently shows impressive results. In case we don’t allow for the possibility of another market boom, the most reasonable positive prediction for the coin is placed around its last major peak of 9 cents per coin, which is around four times its current price. However, this mark isn’t likely to be reached in the nearest future. While the whole market is in stagnation, both the price of the coin is damaged by trader’s insecurity and the usage of the platform is affected by the developers uncertainty in the future of the industry. At the time when the industry will start more or less stable regain of its previous position, the TRON price graph will show the coin as a major gainer. So, the TRON price prediction for the end of 2019 – start of 2020 is around 9 cents per coin. It is probable that TRX price chart will show the price of around 3 cents for the biggest part of the year. However, the TRON price prediction for 2025 and further is much less certain. Even the medium TRON price in 2020 is very hard to determine. 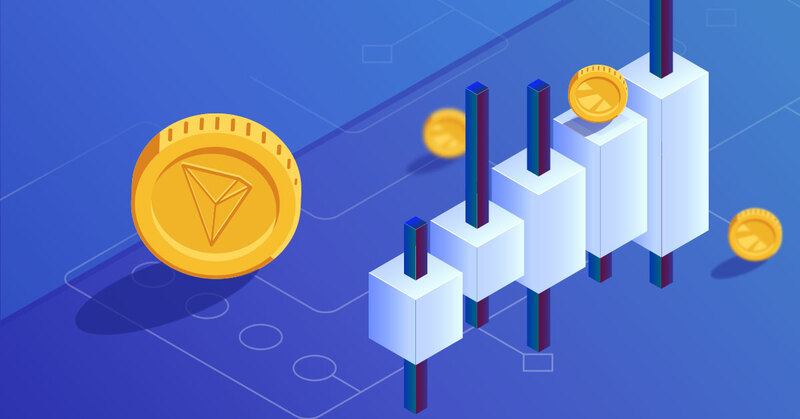 While it is most likely that the dapps market will grow significantly improving the TRON’s financial positions, it will also provide the TRON competitors with a prominent platform for advancement. If you see the TRON coin as a long-term investment the most important question to be asked is “Will TRON beat its competitors in the future?”, because if it will, then its price can increase tenfold and even further. Current exchange rate of the TRON coin can be found here. Disclaimer: This article should not be considered as offering trading recommendations. The cryptocurrency market suffers from high volatility and occasional arbitrary movements. While price analysis is a useful tool, it should not be considered predictive for the future performance of any investment vehicle. Any investor should research multiple viewpoints and be familiar with all local regulations before committing to an investment. Website personnel and the author of this article may have holdings in the above-mentioned cryptocurrencies.